I know it may sound a bit odd, but ripe avocados and boiled eggs combine scrumptiously to create a creamy cultured egg salad that’s just as healthy as it is delicious! If you’ve tried my other favorite ‘kooky’ sandwich filling – Carrot & Cheddar – then you know that sometimes two seemingly odd-paired foods can create quite a taste sensation! So it is with this recipe … by folding diced avocado into egg salad, you get a wonderful creamy texture and lots of added beneficial nutrients, phytochemicals and antioxidants. And just incase you think I’m the only crazy one out there who puts avocado in egg salad, do a quick google search. I was pleasantly surprised to see how many foodies out there enjoy this creamy concoction! Hmm … Maybe it isn’t so odd after all? 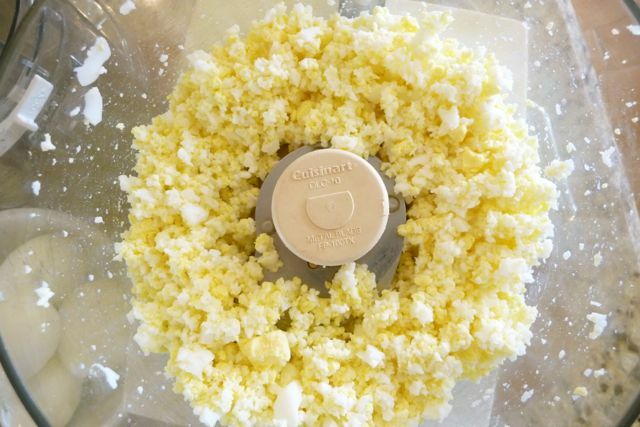 By using a food processor, you can get fine, evenly diced eggs for a creamier texture. However, if you have a rotary-style cheese grater, this handy gadget also works well to finely dice boiled eggs. 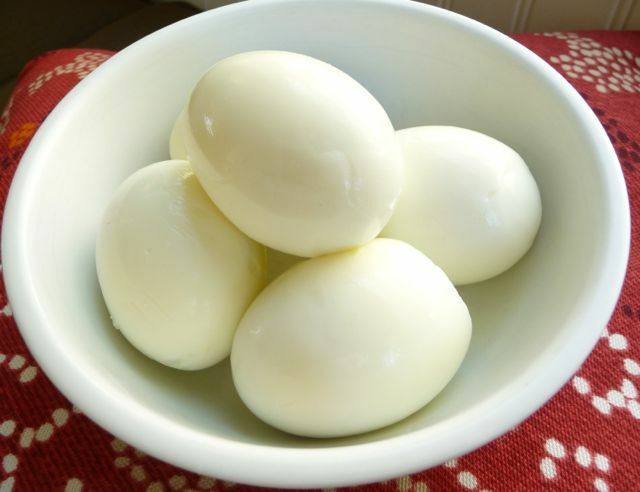 I prefer to add diced avocado to already prepared egg salad in order to enjoy a nice chunk of creamy avocado in each bite. An easy way to dice an avocado is to simply use a knife to cut it into sections as shown above. 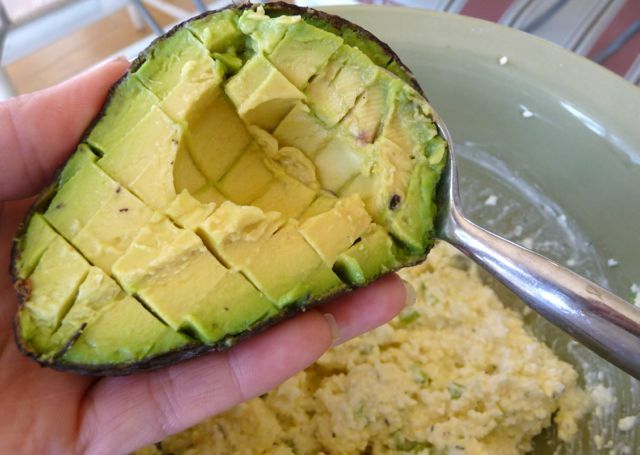 Then, use a spoon to remove the avocado chunks by first sliding it right down the center of the avocado half, and then repeat running the spoon along the inside of the skin to remove the remaining avocado pieces. In a medium bowl, whisk together the yogurt (if using), mayo, mustard, lemon juice and seasonings. Add the diced egg to the creamy yogurt-mayo mixture and combine well. Then, fold in the diced avocado and finely diced celery. Serve on a bed of fresh organic mesclun greens, or on your favorite GF bread. *If you're dairy-free or following Whole30, simply use all mayo for this recipe instead of yogurt. Time-Saving Tip: You can make the egg salad up to two days ahead of time. Just wait to fold in the diced avocado until just before serving in order to avoid the browning effect. Cooked the eggs tonight so I can make lunch quickly after church this weekend. You may have tried this but IF NOT, we just learned to bake the whole eggs instead of boiling and it’s so much better. We put whole eggs straight from the fridge into a muffin pan- one in each muffin hole. Then simply baked them @ 325 degrees for 30 minutes. SO MUCH easier to peel and similar results to boiling but the yolks are slightly more tender and flavorful. Just thought I’d share in case. We’ll be doing them like this from now on. Cannot wait to make this recipe on Sunday. I’ll let you know how it comes out. This is GENIUS! Thank you for sharing I will be baking my eggs in the future. A+ rating from the family. Served this on double toasted Ezekiel english muffins today. The kids really enjoyed it and have asked for it for lunch tomorrow too. My husband is a “food snob”. He said he was very pleasantly surprised. This was more flavorful and more creamy than other egg salads he has had and he enjoyed this very much. I loved the flavor and feel so great about slipping those omegas in. My first experience with whole milk greek yogurt instead of fat free. excellent choice and I’m learning why too. Another keeper, thank you. Just made this for lunch today and both my husband and I loved it more than traditional egg salad with just eggs. I made it more boring than yours, as while we had avocados , eggs and mayo I didn’t have yoguart, dill, or lemon juice. And we didn’t have celery so subbed onion. Still awesome. Thanks for the inspiration! I love avocados and always love new ways to eat them :). 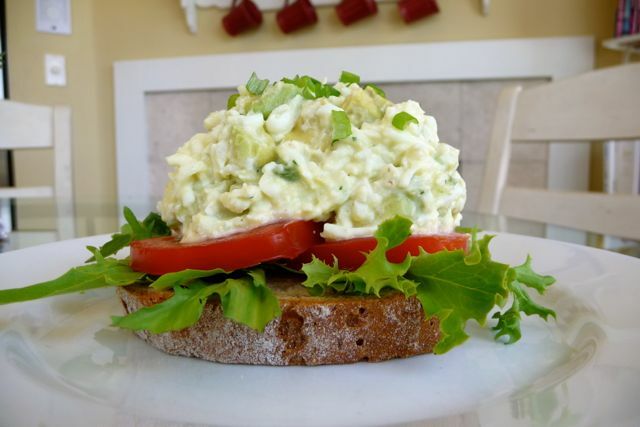 When we started eating healthier I was looking for an alternative to mayo in a tuna/egg salad. This was what I came up with and was pleasantly surprised! Love your food processor tip for getting the eggs so nicely chopped! I SO love this idea and can almost taste the deliciousness of this combo. Thanks so much for sharing. A+ on this one -thank you so much! I’ll admit I was skeptical of the avocado, but it turned out fabulous. Thanks Kelly! Thank you for this fantastic recipe. I’m linking to it, today, and I’m pinning it. Unless it’s guacamole on chips, my hubby isn’t an avocado guy, but maybe this will convert him. I know my kids would totally eat this up. I love the red mugs hanging on your wall. 🙂 Blessings to you! Hey Kelly…what do you use for mayo? ..I’m finding that this is one of the toughest hurdles since eating healthier. I’ve tried to make it… possibly didn’t have a good quality olive oil, but didn’t like it..tasted rancid. Once I master mayo and salad dressing…I will feel complete! Great recipes..thank you! I’m ready to try mayo again and happy to have that mystery solved. This was delicious! My three year old loved it too!